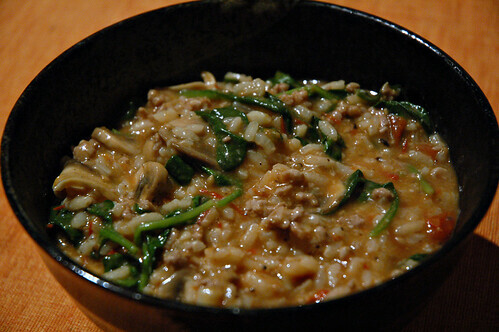 Yut and I made a risotto last weekend as a belated sort of Valentine’s activity. It was delicious! We’d never made a risotto before, although I love risotto, so it fit our Valentine thing — we try to cook something we’ve never done before (which is almost anything really). Tomato and Sausage Risotto, from Martha Stewart Everyday Food via Smitten Kitchen. Mmm-MM! That looks and sounds tasty. I miss Berkeley Bowl. What a gem you have out there.